Windsor Dental Group is proud to announce the launch of its brand new website. We wanted to build a stronger online presence to help patients know what we offer and how we can help improve their dental health. By creating a website that’s easy to use and easy on the eyes, we can reach more people looking for friendly, state-of-the-art family dentistry in the area. Let’s take a moment to go through some of the major features of this new website. Sleek and modern, the new Windsor Dental Group website is as up-to-date as it gets. The layout, images, embedded videos, and overall feel also convey who we are as a dental practice and what we believe in. With so many people browsing the web on their smart phones and tablets, we’ve decided to use a responsive design for the new website. This means that the pages automatically resize and reformat depending on what device you’re using. This makes it much more convenient to find the info you need. Sometimes a website feels like a maze, which can be extremely frustrating. We’ve done our best to avoid those problems by going with an intuitive web design. The emphasis is on clarity and function. You can use menus and text links to get to all of the pages on our website as needed. In addition, we have a Site Map that can link you to all of the pages on the site. Patients can also find our address and contact information on every page, and can contact us online on every page of the website. It’s little things like this that can make a website a useful tool rather than a chore or a puzzle. It’s important to us that patients be heard, which is why we have a page of reviews and testimonials. 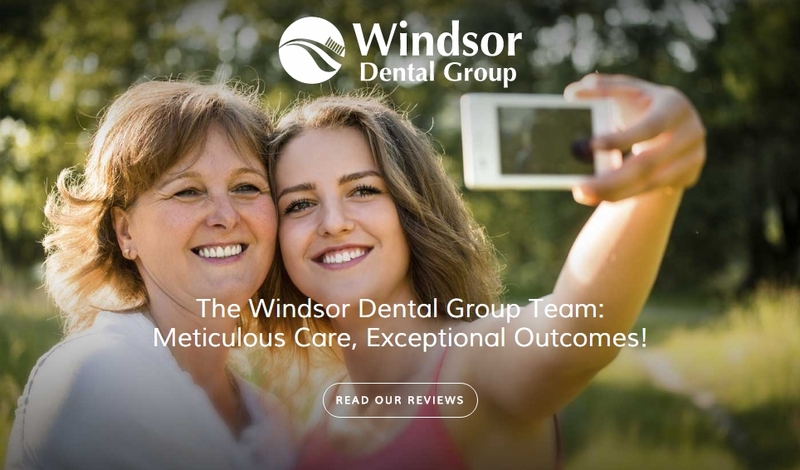 If you want to find out if Windsor Dental Group is a good fit for your dental care needs, we encourage you to read these reviews and make the right choice for you and your family. Patient-centered dental care means going that extra mile for the people we value most. That’s why our website includes a dedicated page for dental care special offers. This includes discounted services and other great deals. Patients have a lot of questions about their dental care needs, innovations in the field of dentistry, and what’s going on at the practice. Our dental care blog will help address these matters through regularly added content. Look out for tips on oral hygiene, exploration of numerous dental health topics, and updates on what our team is up to in the office. The official Windsor Dental Group website isn’t the only place to find the practice on the web. Our website also includes links to us on Facebook, YouTube, Yelp, and Google+. There are so many options for connection and interaction with our team. While all of the features listed above are nice on their own, they emphasize our main focus here at Windsor Dental Group: the patient. These online features are meant to help patients get information, become educated and empowered about their dental care needs, and to undergo the treatment they need. We’d love for you to contact us about the website, or stop by in person to say hello. To learn more about the many ways we have available to make your smile look great and be its healthiest, be sure to contact the dentists of Windsor Dental Group. Our team is here for you, and we all look forward to your visit.